White linen shade has brushed nickel accents at top and bottom for a rich contemporary look. Contemporary indoor lighting fixture includes hardware and installation instructions. Matching round wall plate is 4 1/2 inches diameter. Use with (1) Candelabra type, E12 bulb(s) - 60 watt max. Bulbs sold separately. Product comes with a 1 year limited warranty; parts, repair, or replacement. Modern urban decorative wall fixture is a perfect match for bath and hall. Clear glass cylinders around frosted glass cylinders inside create bright shine without glare. Full coverage wall plate easily covers existing openings in wall from previous fixtures. Modern urban decorative wall fixture is a perfect match for bath and hall. Clear glass cylinders around frosted glass cylinders inside create bright shine without glare. Square wall plate easily covers existing openings in wall from previous fixtures. A fashionable brushed nickel finish combines flawlessly with clear ribbed glass shades, making this Filament Design Collection wall sconce sleek and sophisticated. If you are looking for a bold, new-age accent for your home, look no further. It uses one 100W maximum incandescent medium base bulb (sold separately). 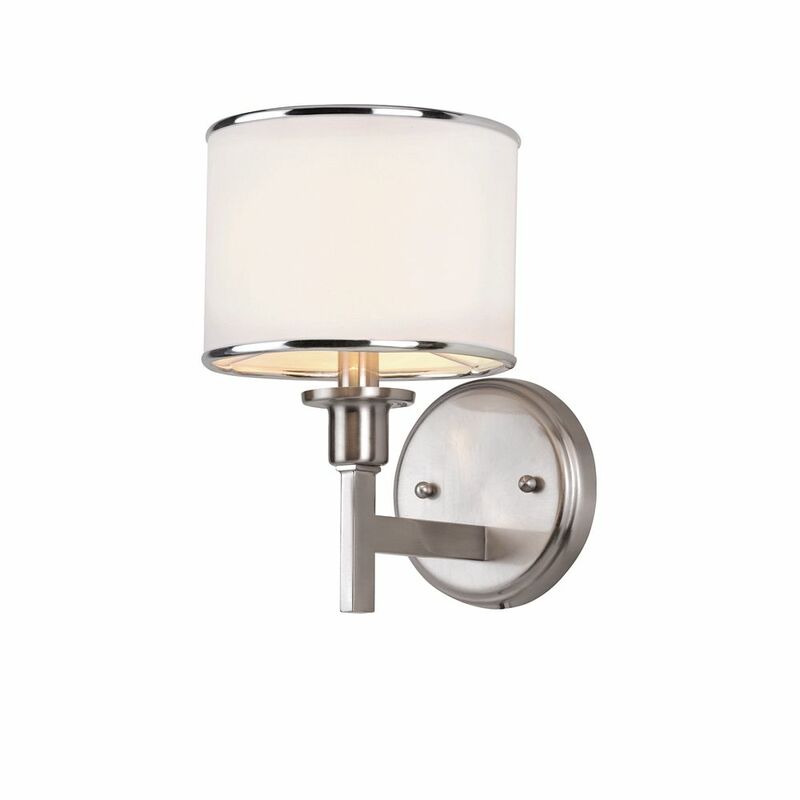 Nickel and Linen Wall Sconce White linen shade has brushed nickel accents at top and bottom for a rich contemporary look. Contemporary indoor lighting fixture includes hardware and installation instructions. Matching round wall plate is 4 1/2 inches diameter.